What others say about chiropractic care can help you make the right health care choice. Review a selection of Precision Spinal Care patient testimonials below and please email me or contact the office if you have any questions. You’ll like what you read about the Chesapeake Chiropractor! I found your office to be full of high energy folks all wanting to help. So far I am well pleased with the treatment. I am so glad I tried this type of treatment. So much gain so soon. Traditional medicine did not alleviate the pain. Dr. Packer and his helpful and caring staff Have set me on the road to recovery. Thanks! My wife and I had a wonderful experience with Precision Spinal Care, we have shared our experiences with friends. Dr. Packer and his staff are a Godsend! I’m incredibly pleased with them, and I’m very happy to have found them! I believe they will do more good for my chronic pain, than any other doctor I’ve ever seen! I highly recommend them to anyone looking for real help getting rid of pain. You Will Get The Best Care! While it does take time to see the doctor. It’s well worth the wait. Dr. Packer is amazing! I’ve had several occasions where I’ve lost feeling to my legs. Dr. Packer immediately adjusted me and I immediately could feel my legs again. So, while you might wait, remember not every case is black and white. A doctor who is willing to listen and take his time with you means you will in the end get the best care! So, glad I’ve gotten a chance to be cared for by Dr. Packer and his excellent staff. Thumbs up for Krystal his X-ray tech. She’s very knowledge, helpful, kind and arrives early to ensure those of us who have to get to work after our care can with ease. My suggestion… If your contemplating care with his team. Remember it takes time to heal in the correct spinal position. 3 months without missing a day and I know you’ll see the difference as I have. Highly recommend! Dr. Packer’s knowledge and expertise was quickly evident in my appointment. My husband and I were certain that the technique and instructions for followup care would be a great aid in treating my chronic pain, help with fibromyalgia symptoms and improve my overall quality of life. Love both doctors. Thanks guys. Best place for any spinal needs! Everyone was friendly and personable. I felt like a person and not a patient. Love this practice and so happy my family found it! Starting each day Migraine free has been a true feeling of good mornings since I have been going to Dr. Packer. Being able to walk without the hip and knee pain has clearly made a difference in my overall day, everyday now. I hope and pray I am never in another accident but if I am your office will be my first stop and not physical therapy. I have been going to chiropractors for over 25 years to maintain my body for athletic activities I enjoy such as training and competing dressage horses internationally. 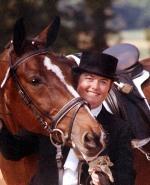 I met a NUCCA practicioner at a horse event in Wisconsin and I was impressed with what she had to say about NUCCA. She referred me to Dr Packer. After Dr. Packer made the adjustment on my first visit, I have been pain-free since and very grateful to be able to continue enjoying my passion for riding in my senior years. When I first came to Precision Spinal Care: I was unable to walk even a few steps without having to complain or stop. I was unable to walk up steps without holding on to the railings and had pain shooting down my legs. Since beginning care: I can now walk up and down stairs, go to the mall and do outdoor activities that I could not do before. I have definitely made a 360 degree turn around since my first day. When I first came to Precision Spinal Care: I have chronic fatigue and my right hip had become painful. I was suddenly experiencing intermittent pain in both knees while walking, to the point of almost falling. Since beginning care: To my surprise, my hip and knees do not hurt. My fatigue is greatly diminished. When I first came to Precision Spinal Care: I had head, neck and low back pain. Since beginning care: My neck is no longer stiff and my head is no longer painful, which is a wonderful feeling since I have been to different chiropractors since 1989 without relief. My balance is better. My husband is so glad I have found relief. He was tired of me always complaining about my stiff neck. I have NO MORE PAIN! When I first came to Precision Spinal Care: After being thrown from a horse, I had back pain and sciatica. I also had pain and numbness from my shoulder down my left arm, including my elbow and hand. Since beginning care: I have no pain or numbness in my left arm, elbow or hand. My low back pain is nonexistent. I have only periodic discomfort with any tightness or pain in my shoulder. When I first came to Precision Spinal Care: I had moderate neck pain on the right side of my neck. Since beginning care: The improvements I’ve experienced are: less frequent and less irritation of my neck area. When I first came to Precision Spinal Care: I had neck pain and discomfort following a car accident. Since beginning care: My neck pain was alleviated within a few weeks of beginning treatment. When I first came to Precision Spinal Care: I had migraine headaches, low back pain and numbness in my hands and feet.Since beginning care: My migraines are virtually nonexistent, the numbness is completely gone, and the low back pain is SO much better! Even my menstrual cycles are now regular! I have never imagined my overall health would improve when I came in here for my headaches! Thanks for making my life so much better!! When I first came to Precision Spinal Care: I was in excruciating pain. I could not lie down. I could not operate my vehicle. I could not even get a good night’s sleep. My walking was limited and I tried exercising but the pain was unbearable. Since beginning care: I am able to function about 90% better and I also walk 4-6 blocks now without stopping. When I first came to Precision Spinal Care: I had burning, stinging pains ranging from my lower back – sometimes all the way down my leg to my foot. Since beginning care: I noticed a gradual loss of pain to no pain at all as treatments continued. When I first came to Precision Spinal Care: I had considerable back, hip, neck and leg pain especially during and after walking long distances. Since beginning care: Significant improvement in all areas mentioned above, with most having been eliminated. My quality of life has improved dramatically. When I first came to Precision Spinal Care: I had spasms in my right scapula, numbness and tingling in my right arm, weakness in my right arm and wrist. I had increased allergy (airborne) symptoms (ie: stuffiness) with tenderness on the right side of my face. Since beginning care: All of my symptoms in my arm, wrist, scapula that I had on my right side are gone! My sinus/allergy problems are about 75% improved! When I first came to Precision Spinal Care: I had lower back pain, sciatica with frequent spasms and arthritis stiffness. Since beginning care: The back spasms are less frequent and not as severe. With yoga stretching and reasonable exercise I can manage my arthritis and stiffness now as well. When I first came to Precision Spinal Care: I had pain in my lower neck and back due to an injury. Also, one leg was shown to be unequal with the other. My misalignment was causing headaches, neck and back pain, as well as some leg pain. Since beginning care: All of the areas, which had significant pain, have improved. Dr. Packer, Dr. Harrison and their staff are tremendous in providing the best patient care. When I first came to Precision Spinal Care: I was having severe lower back and leg pain accompanied by constant neck pain and headaches. Since beginning care: My neck pain, and consequently my headaches are completely gone. The leg and lower back pain are 90% better. I feel so much better. When I first came to Precision Spinal Care: I had a bad case of shingles that left me with a deeply infected major nerve around my body and severe pain. The medical term for my condition was Post Herpetic Neuralgia. Three medical doctors told me there was nothing they could do to relieve my pain, which was very debilitating. It was extremely painful to wear clothes on my upper body, to use my right arm, to lie down or let my back touch anything. To walk or take a deep breath was painful. The neurologist told me it could take years to recover and some people never recover. At best, she said, a few people recover from it in several months. Since beginning care: I came to Precision Spinal Care as a last resort three months ago and I am pain free today. My healing was progressive with two appointments per week. Now I come once a week to insure the permanence of continuing to stay pain free. When I first came to Precision Spinal Care: I had a lot of pressure from the neck up. My jugular vein on the left side protruded a lot especially when I would bend over even slightly. My eyes were very sensitive – lots of pressure. It bothered me to read at times. Since beginning care: I no longer have pressure in the head and neck area. My jugular vein is more normal and I have no pressure in my eyes. When I first came to Precision Spinal Care: I had a stiff neck with pain with even a low degree of movement. I had soreness and stiffness in my mid-back. I had soreness and stiffness in my lower back that would “catch” if I bent down. I had numbness and tingling (going to sleep) in my arms and sometimes in my legs while sleeping. Since beginning care: I have better movement in my neck – I can turn my head more freely without stiffness or pain. My mid-back soreness and stiffness are completely gone. My lower back has much less stiffness, soreness and “catches” less – it is almost gone at times. I have been doing heavy gardening and am pleasantly encouraged that my back and neck areas have held up so well. Also, I have had no numbness and tingling in the arms and legs during this last month. I also seem to have more energy. When I first came to Precision Spinal Care: I had headaches. Since beginning care: I no longer have headaches and am feeling good all over. When I first came to Precision Spinal Care: I had headaches every day. Since beginning care: I only have a headache about once every two weeks now. When I first came to Precision Spinal Care: I had extreme hip pain, pain and numbness in my legs and lower back aches. Since beginning care: The numbness and pain going down my legs are gone. My hip pain is only occasional and my back aches are better. When I first came to Precision Spinal Care: I had knee pain, thigh pain and continual back pain. Since beginning care: I had to stop and remember my symptoms. I would say the knee and thigh pain are 100% gone. The back pain is no more than day to day muscle fatigue on a 52 year old. I am totally satisfied. What does one say to someone that has restored their quality of life and quite possibly saved their life? There was this diagram of the human skeleton, showing the affects of a “head tilt” on the muscles of the upper back, pelvis, and on relative leg length. As soon as I saw the picture and read the explanation, I said “I’m that guy! I had x-rays taken and low and behold – I really was that guy. Dr. Packer explained to me that as a result of the improper alignment between my head and neck, my spinal column was being affected in a manner similar to kinking a garden hose, in that not all the messages from the rain could efficiently get to where they needed to go and that this was what might be causing my problems. Dr. Packer didn’t actually tell me that he could help me, but he did say in no uncertain terms that some people with my symptoms and in my condition had seen improvements as a result of upper cervical therapy. I am a 53 year old male who for over 35 years suffered through extended periods of unbelievable leg, knee and low back pain, tightness and stiffness. I suffered from massive headaches, multiple bouts of prostatitis, Irritable Bowel Syndrome (IBS); I couldn’t breathe through my right nostril and I got frequent sinus infections (roughly 4 per year). Additionally, I would on occasion, have the most horrible “pinch” where the neck joins the shoulder mostly on the left side, but occasionally on the right side that would last for, in some cases, months. Multiple doctors in multiple disciplines examined me; some provided temporary relief, some didn’t do me any good. I would go to a chiropractor, get an “adjustment”, feel better for a few hours, and then the problems would come back. Also the pain moved; neck one day, low back or mid back the next, it kept on moving. No one, until Dr. Packer and his team looked at me was able to correctly diagnosis my condition as an improper alignment between my skull and the upper most vertebrae (C-1). In my particular case, my head was “tilted” 3.5 degrees to the right and 0.5 degrees forward. When I was 15 years old, I suffered a blunt force trauma to my head that resulted in the condition discussed above. My first adjustment: I was precisely positioned on my left side and the Dr. applied a gentle pressure to the right side of my neck, just back of the ear. No snapping, no cracking, no twisting or hard pushing; just several applications of a gentle pressure just back of the ear and in the area where C-1 and the head join. It was explained to me that this type of adjustment requires a precise vector and not a great deal of force. I thought well, another dead end; at least it didn’t cost me anything except my time. I drove home, lay down to take a nap and woke up about two hours later without any pain. I don’t mind telling you I cried, first because I was pain free for the first time in my adult life and secondly because I now knew there was hope. I have had to have several maintenance adjustments since that initial adjustment (average of one per month), or 12 per year, but compared to the 2-3 trips a week to a chiropractor I was making before and not getting relief…well you decide, up to 150 visits per year to the chiropractor and no lasting relief or 12 trips a year and no pain. I am now able to do the things that over the years I have lost, like: walking, standing, bending, stooping, cutting the lawn, bending over, gardening, getting a good night’s sleep and so on and I am PAIN FREE! I have lost 60 pounds; I exercise daily by lifting weights and swimming (prior to the adjustment, if I went to the gym once a week, it was an event and then I only sat in the hot tub). I feel better than I have at any time in my adult life, the pain is gone, my IBS is gone, I haven’t had a sinus infection or prostate problem for 1.5 years and I can breathe through my right nostril. If I hadn’t had the procedure performed on me and experienced the affects first hand, I wouldn’t believe it. If you are living in pain, you owe it to yourself to try this out. Thanks Dr. Packer, you and your team can’t possibly imagine what you have done for me. Since beginning care: I only have pain in my lower back but it is gone for weeks. It will come back if I push myself too hard but I have no pain bending forward or walking. I sleep better!!! Now my pain level is a 0-1. When I first came to Precision Spinal Care: I had migraines, leg and hip pain, neck pain and stiffness. Since beginning care: My headaches are less frequent and intense – very much improved. My leg and hip pain is not a problem now. My neck has greatly improved with flexibility, there is less stiffness and very little pain. When I first came to Precision Spinal Care: I had pain down my left arm, neck and lower back pain. Since beginning care: My neck and arm pain are almost gone. I only have occasional discomfort now. My lower back pain is much improved the least pain I have felt in 20+ years. When I first came to Precision Spinal Care: I had pain in my shoulder and lower back with a constant ache. Since beginning care: My shoulder and back pain are gone. I am no longer stiff and achy in the morning. I am able to stand and work for long periods without pain. When I first came to Precision Spinal Care: I had lower back pain, upper shoulder pain and my head and neck would lock up – I could not rotate my head fully to one side. Since beginning care: My symptoms are completely gone after 8 months of treatment. I feel better now at 35 than when I was 28. Actually, my health overall has improved as well. I am not getting sick as much as I used to. When I first came to Precision Spinal Care: I had severe facial pain from Trigeminal Neuralgia, low back pain and was taking at least 5 different medications for pain. Since beginning care: I am no longer on any medications! I have no more low back pain, very little facial pain with much less frequency of attacks! When I first came to Precision Spinal Care: I was having bad migraines, neck pain, upper and lower back pain all on a daily basis. Since beginning care: I no longer have the neck pain. The back pain has lessened. The migraines have just about stopped. When I first came to Precision Spinal Care: I was suffering with low back pain and unable to use ll of my fingers for typing on home row for my job. Since beginning care: I have improved overall. I am able to better use my fingers for typing and do not suffer back pain in my lower back. When I first came to Precision Spinal Care: I had mid to lower back pain preventing sleep at night. Since beginning care: The pain has been greatly reduced. Sleep is not interrupted by back pain and my back feels much better. When I first came to Precision Spinal Care: I was experiencing low back pain and pain in my neck. I was also experiencing headaches associated with the neck pain. Since beginning care: The pain in the lower back and neck has all but gone. The headaches are gone too!!! I am more mobile after the care. When I first came to Precision Spinal Care: I was in a good deal of pain on my right side. I had headaches, neck and shoulder pain and spasms that rand down my back. I had hip and lower back pain shooting down my right leg. I was also walking with a limp, which caused more pain, just driving a car or sitting hurt a great deal. Since beginning care: No more limping! I can drive my car and sit – almost 95% better. I hardly ever get headaches. My muscle spasms have greatly improved. I am 85% better in all over pain. It works! When I first came to Precision Spinal Care: I had severe pain in my lower back during sleeping hours for approximately 6-8 months. The pain would awaken me after 2-3 hours after going to sleep. Since beginning care: During the past two months, the nightly severe pain has decreased in discomfort allowing uninterrupted sleep. This has been a welcome but much needed nightly rest. I have experienced 80% relief. This is attributed to keeping every appointment and following the individualized treatment plan. When I first came to Precision Spinal Care: I had a high level of pain in my upper arm and tremors in my right hand and lower arm. Since beginning care: My first contact with Dr. Packer was on 08/28/08 and as of 01/19/09 I have had approximately 34 sessions of treatment. There is very little pain if any in the right arm but still some tremors which are believed to be a mild case of Parkinson’s Disease. I will continue to be monitored by Precision Spinal Care as long as needed. At this time, I feel much better and don’t need weekly treatment or adjustments. When I first came to Precision Spinal Care: I had lower back pain, daily headaches, major pain in one shoulder as well as pain and discomfort in my knees and hips. Since beginning care: All of my symptoms have disappeared. I feel great. I struggled with lifting weights at the gym with my shoulder, but no longer. My headaches are gone and I don’t experience any like I used to before coming to Precision Spinal Care. I would recommend anyone with back or other troubles to seek treatment from PSC. When I first came to Precision Spinal Care: I had migraine headaches seven days a week. Some would last 2-3 hours. Since beginning care: I no longer have migraines. When I first came to Precision Spinal Care: The lower part of my neck near the shoulder blade and the upper part of my neck near the hair line and above it were painful. Since beginning care: I am so much better and I don’t experience the pains as bad. When I first came to Precision Spinal Care: I was having moderate to severe tingling and numbness in my left hand and arm. It would radiate all the way to my armpit. Since beginning care: For the past 2 months I have hardly noticed the tingling. I occasionally have numbness in the tip of my index finger, but that is almost gone!!! I AM VERY HAPPY. When I first came to Precision Spinal Care: I had sharp pain in my head frequently and stiffness in my joints. Since beginning care: I am now pain free. The stiffness in my joints is gone too. I also feel my posture has improved greatly. When I first came to Precision Spinal Care: I had lower back and sciatica down both legs to my knee. I also had nerve pain down my right arm. Since beginning care: I have experienced 90% improvement with my lower back and sciatic pain. I have had complete, 100%, improvement in my right arm pain. Call your Chesapeake Chiropractor now to schedule an appointment and learn more about chiropractic care!